Our design experts will make it happen. They will work with you to design a website that fits your organization’s mission and personality. We guarantee you will get noticed! 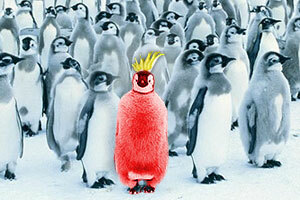 As you know, first impressions make lasting impressions. Your website’s design makes an important statement about your organization. A professional website design gives you instant credibility. Likewise, an unprofessional design robs you of it. So what are the elements of a professional website design? Like most people, you probably cannot list the exact details of what makes a website look professional, but you instantly know one when you see it. And you also know an amateur website design when you see it. So what exactlly does your website need to have a professional website design? Let’s start with what it doesn’t need. Your website design does not have to contain lots of fancy graphics to be professional. In fact a professional design can be simple. The complexity of the design and the amount and type of graphics are highly dependent on your industry and target audience. The goal is to align your websites design with your business objectives. For example you have probably been to websites with lots of animated pictures that are downright distracting, not to mention slow to load. Unless you’re a design firm, the graphical elements of your website shouldn’t overwhelm the user. They should create an environment that showcases your products and services in the best possible manner. The elements of a professional website design have purpose. They are there to serve the alignment of your objective and the needs of the user. Have you ever gone to a website and scratched your head trying to figure out what they are offering? Or maybe you know what they offer and you can’t figure out how to get more information or how to purchase it? Unfortunately this is an all too common experience. Murder mysteries may be popular reading but website mysteries are not. Clarity is the first ingredient to a professional design. Everything about your website should speak clearly to the user. E.g. 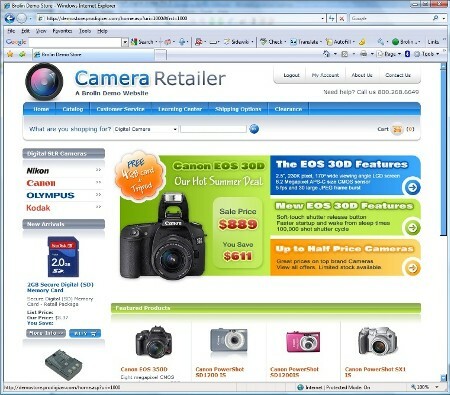 it is clear in the the website shown below (Figure 1) that they sell cameras. The professional website design also creates instant credibility. Most people that use the web are familiar with the web’s standard conventions and they rely on website standards to make it easier to use. Examples range from hyperlinks being underlined, to clicking on the logo in the upper left corner of every page to return to the home page. For people to perceive your website as professional it must conform to the accepted web standards. If it doesn’t, people will say “these guys don’t even know how to create a website, how am I going to trust them with my business” and they will leave, end of story. Clear and consistent navigation options are essential to a professional design. At all times it should be clear to the user how to get from where they are to where they want to go. If you provide consistent navigation options, users will quickly recognize the pattern and they will appreciate the fact that you have a well thought out design, further boosting your credibility. Intuitive means “Don’t make me think”. If the user has trouble figuring out how to use your website then their mind is distracted from their primary purpose. This quickly leads to frustration and ultimately to their leaving your website. Creating an intuitive website requires a well thought out design that is focused on meeting the needs of your customer and your objective. Everything on your website should serve this purpose and should do so in the simplest and most efficient manner. To create an intuitive design you must understand your customer and their needs. This includes understanding how they think, their vernacular, and their web usage proficiency. Balance has a psychological affect on users and is perceived at the sub-conscious level. Professional designs have a balance between the amount of white space, margins, borders, copy and graphical elements on the page. A properly balanced web page places greater weight on important items and less weight on less important items. An essential aspect of a properly balanced design is that items do not play tug-of-war. In other words, the items on any give web page must not compete with one another for attention. Imbalanced websites can cause tremendous noise at a sub-conscious level. You have probably visited such websites that are downright painful to use. A professional website design feels good. Note that when used purposefully, imbalance can be used to take the user in a specific direction or to focus them on a specific component on the page. But this must be used judiciously because too much of it will cause the undesirable tug-a-war affect. Cleanliness means you don’t have trashy elements on your pages. We’ve all seen “dirty” websites that are cluttered with garbage. Clutter distracts the user. Professional designs are clean and without clutter. Clean website designs separate content by purpose and they make it easy for the user to locate. Most visitors to your website have a single purpose in mind such as to purchase a specific product, to locate a specific solution to a problem, to gather information about a specific subject, to report a specific problem, etc. Your home page is the entryway to your website. The user should be able to walk in your front door without tripping over something. Once inside they should be able to quickly find the doorway to the next room that meets their intended purpose in visiting your website. Each doorway should be clearly labeled and easy to locate. When the user clicks through to a page, that page should meet their expectations. Our web designers have the experience to create a professional website design that will convey instant credibility and increase the sales of your products and services. Contact us today for a free no obligation quote. We guarantee you will be pleasantly surprised!